The setting of this work may seem a little strange, especially as the cemetery headstones are in the foreground. However, on a fine summer day in the English countryside, there is no more peaceful a place to be found than an ancient cemetery, especially one with such a fine example of Norman architecture in the background. The painting is a celebration of sunshine and shadow, and shows Leech's wonderful ability to produce lustrous work with a very limited palette. 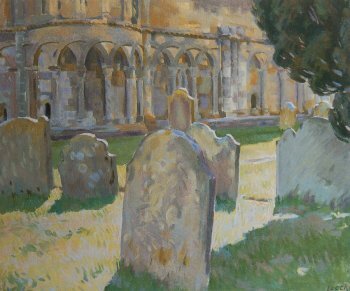 According to Denise Ferran's catalogue notes for the 1996 exhibition: Churches and cemeteries fascinated Leech as subject matter for painting. He had painted La Cimetiere de Saint Jeannet circa 1927, and he had painted The Church, Thornton Le Dale, Yorkshire, during the war in 1944. Since he was now unable to go to France each year, because of the war, increasing age, and a shortage of money, the South of England must do him as a substitute. "There is quite a lot of sunshine here, it must be one of the sunniest places in England, and there are boats and water, though the boats are really yachts." Not only did he paint the priory church but he also painted the River Stour at Christchurch, as it flowed down to the sea at Harwich from the Gog Magog Hills. Leech is well known for the scenes he painted around the harbour at Concarneau with brightly coloured sails reflecting off the water. Many of these works were built up by the application of elongated streaks of hot colour. Baie de la Foret is a much quieter and sombre approach to painting, perhaps inspired by the solitude found away from the town. Painted circa 1912, it demonstrates the maturity Leech had attained in his work by this time, especially in his handling of the perspective drawing. 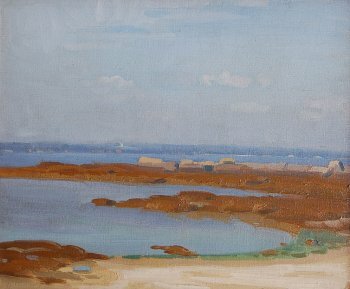 He portrays a distant coastline beyond a wide expanse of water with small bays and inlets in the foreground using a simple palette of blues, greens and ochres. The fluid paint is applied with confidence and joyfully records the wonderful light and atmosphere of a coastal view in summer. The Baie de la Foret gets its name from the Foret Fouesnant, just north of the coastal town of the same name, about five miles from Concarneau. The canvas was painted on a small road that runs down to the sea close to the village of Kerleven. The area is well known for its spectacular views over the Bay. Leech chose an aspect looking west over one of the inlets at the head of the Bay. The small town of Fouesnant can be seen on the horizon. This unique study of Wicklow harbour is handled in much the same way as the many views Leech did of the harbour in Concarneau. 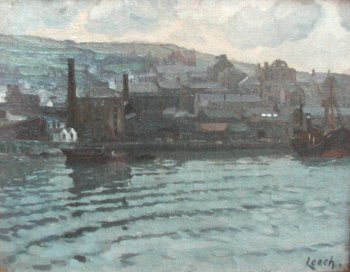 The most distinctive feature is his handling of the rippling tide in bands across the canvas with the quayside buildings reflected off the water. There is an overall green tone which might suggest his delight in returning to his homeland after a long spell in France. Leech records a scene that has long since changed. The green fields above the town are now almost covered with houses. The chimney stacks of the old gas works have been demolished and the packet steamer no longer makes the crossing to England. 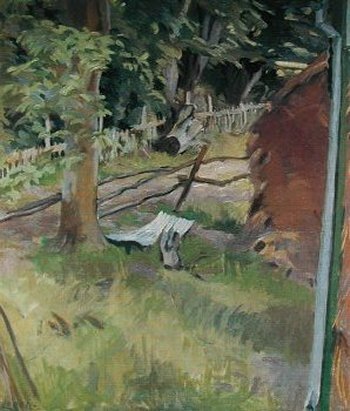 The perspective of this work suggests that it is one of the many views Leech painted in the 1940s looking out through a window. Normally, part of the window frame is included but not in this case. However, the proximity of the drain pipe to the edge of the canvas strengthens the suggestion. The unconventional planning of the painting is distinctly Leech. Although the fence along the edge of the forest leads the eye towards a sunlit field, the painting retains a flat single dimension common to many of the associated works. One interesting example for comparison from the same period is Haystack and Window, Evening which shows a single frame bar to the bottom and lace curtain to each side. This colourful painting is an example of the great variety to be found in Leech’s work. The luminous sheen of the gown makes a very strong contrast with the rich, exotic pattern of the background. Although the model appears to be ill at ease, she is portrayed with poise and elegance, her arm and hand being particularly well painted. The composition may be compared to The Cigarette, painted around the same time, particularly in the handling of the costume. 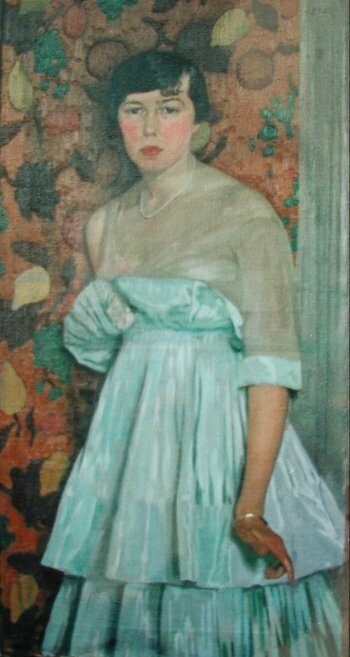 The format can be compared to the portrait of Suzanne Botterell, painted a few years later. At the age of 18 Leech transferred from the Municipal School of Art in Dublin to the schools of the Royal Hibernian Academy. In these early years, Walter Osborne made an indelible impression on him. This was to shape his early career and influence his approach to painting. He left his native Dublin in 1903 for Paris, the start of a long career away from his homeland. From his earliest days in France he cultivated an appreciation of the landscape to which he remained faithful for life. He travelled extensively throughout Europe, eventually settling in England. His output consists mainly of coastal and harbour scenes, landscapes, interiors, still life and portraits. Later in life, he developed a distinctive style which is immediately recognisable, employing his own carefully thought out principles and ideas, particularly in his approach to perspective. Some of his contemporaries recognised this unique quality and were influenced by his work. Go to the Sales pages for details of paintings currently available. The Archive pages illustrate paintings we have sold in the past, and indicate the type of paintings we are interested in purchasing. The Site Map and Artist Index will help you find your way around our pages.